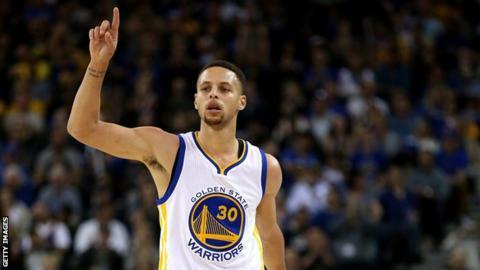 Golden State Warriors have made NBA history with a record 73 wins in a season by beating Memphis Grizzlies. The 125-104 win in Oakland means the defending champions surpassed the previous record of 72 set by Michael Jordan's Chicago Bulls in 1995-96. Steph Curry also became the first to net more than 400 three-pointers in a season, taking his tally to 402. Warriors coach Steve Kerr, who played for the 1996 Bulls team, said: "I never thought anyone would break it."